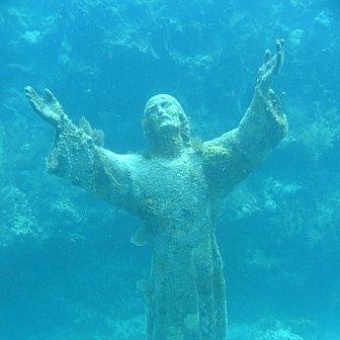 Christ of the Abyss (Cristo degli Abissi) statue, submerged in the waters of the Protected Marine Area of Portofino, has become one of the most famous and popular diving sites in the world. The statue was placed in the waters of San Fruttuoso di Camogli on 22nd Aug 1954 at a depth of about 18 meters by the Costa family. It was the idea of the Italian diver Duilio Marcante, a pioneer of diving techniques who wanted to dedicate it to the memory of this friend Dario Gonzatti who was the first Italian to use SCUBA gear in his dives and tragically died near this spot in 1947. The statue is meant as a reference point for divers in distress and it has become a symbol for all scuba divers. It was made by sculptor Guido Galletti in bronze and is impressive 2.5 metres (8.5 feet) tall. To acquire the amount of bronze needed for its creation, the sculptor melted and fused together medals, naval artefacts and bells. The statue was raised to land to be lovingly restored in 2003 due to the increased corrosion and replace a hand that had been broken by an anchor. It was returned to the water in July 2005. As almost everything in San Fruttuoso, diving in this spot is a unique experience. Amongst the natural beauty of the Protected Marine Area you are greeted by the open hands of the statue directed towards the sky (surface ) in sign of peace. The dive is fairly easy as it takes place in relatively shallow waters and has the protection of the Bay against strong winds. There are numerous diving centers in the nearby town of Santa Margherita that organise diving expeditions to the waters in front of San Fruttuoso and around the Riviera coastline. A moving ceremony is held on the beach of San Fruttuoso on the last Sunday in July each year when a torchlight mass is held to commemorate all those who have lost their lives at sea, with divers placing crowns of flowers at the foot of the underwater Christ. If you cannot dive or simply prefer to stay dry, you can approach the spot with a boat in a clear, calm day and peak at it from the water surface. Another option will be to visit the public Church of the San Fruttuoso Abbey and see its replica near the entrance. Interestingly, there are other Christ of the Abyss bronze casts created from the same mould around the world. One is located in the waters off the coast of St. George, the Caribbean capital of Grenada. It was presented as a gift of the navy of Genoa for assistance in rescuing the crew of Italian vessel Bianca C’ , a liner that burned just outside the port of St. George and the statue was submerged in the waters in October 1961. A third replica stands in the waters off Key Largo in the upper Florida keys facing a beautiful and large brain coral. It was donated to John Pennekamp Coral Reef State Park in 1965 by the Cressi family to celebrate the creation of the first underwater park in the United States.